Mobile Email in 2016 and Beyond: Are You Doing It Right? For the past several years, marketing thought leaders have been calling mobile one of the “biggest trends.” If you aren’t taking advantage of mobile, they said (and we did, too) then you were leaving piles of potential revenue sitting on the table. But here’s the thing: Mobile isn’t just a trend—it’s not a fad or a flash-in-the-pan concept. Mobile is here to stay. But how do you know if you’re doing mobile right? Sure, you’ve seen a jump in engagement—but how do you know you’re taking full advantage? To help you determine your next move, we’re sharing a few mobile marketing tactics you should use right now. 55% of emails are now opened on a mobile device. Mobile clicks generate 2x the revenue of desktop clicks, on average. 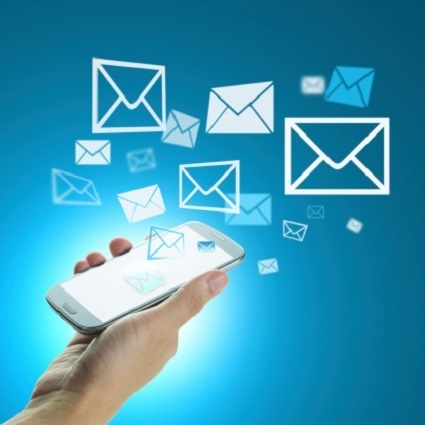 Mobile revenue makes up 20% of all email-generated revenue. Responsive design can improve email click-through rates by 15%. Now that we’ve got your attention, here are three value-added tactics you can include in your mobile strategy to keep you on the leading edge of this critical channel. Incorporating animated GIFs and video into the body of your email can dramatically increase reader engagement, particularly when the email is viewed on a mobile device. This email from Poncho, as described by the bloggers over at Emma, is a perfect example. What better way for a smartphone weather app provider to demonstrate how the app works than via animated emails viewed on a smartphone? If animated GIFs or video feels like a good fit for your brand and your email strategy, just be sure to watch the size of the file. Experts recommend nothing larger than 125K; anything bigger than that can cause download issues for the reader. It’s also a good idea to include a stand-alone image in the first frame of the GIF, just in case the reader’s phone is unable to download the full file. Fat-finger syndrome is real. In fact, as many as half of all mobile clicks may be made in error. So if the call-to action is arguably the most important element of your email, and if you know that more than half of your subscribers are likely reading your emails on a mobile device, and you know that most of your subscribers have trouble making clicks on those devices, it certainly behooves you to spend a little extra time making sure your call-to-action is as easy to click as possible. Many marketers might think that creating a “click to buy” button is the perfect answer. And it can be—if you create your button the right way. Very often, designers will create an image for a button. But if your subscriber’s email client blocks images by default, your subscriber may never see your beautiful button. Enter the “bulletproof” button: a button built directly in HTML or CSS code. Even if an email client has images turned off, this coded button will still be visible. There are several options for programming these buttons, so choose the method that fits your needs and design approach. Personalization, customization and contextual messaging are nothing new to email marketers. But the more data that becomes available to us, the more specific we can get with our messaging. Particularly for brands that need to reach on-the-go consumers, hyper-targeted emails can drive significant results. For example, imagine you operate a busy downtown restaurant, and you’ve just redesigned your take-out dinner menu. You might start segmenting your list by geolocation, targeting people who work in the city but live in the suburbs. You might further refine your list to include working parents with school-aged children, with a family income over $150,000 per year, and who use an iPhone as their mobile technology. Once you generate this list, you email a coupon timed to arrive in the subscriber’s inbox at 3 p.m. on Wednesday—right when folks might first start thinking about that night’s dinner. Maggiano’s Little Italy restaurants recently took just such a data-driven approach to develop a highly sophisticated understanding of their target consumers. It goes without saying that we’re email fanatics. As new tools become available, and new technologies make the difficult effortless, we cannot wait to see what’s next. The future looks rosy for email marketers in 2016 and beyond, and we are here, right by your side. Ready to enhance your data-driven approach? Request your free Email Intelligence Match Test right now.